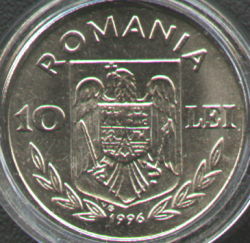 Common obverse: ROMANIA, denomination "10 Lei", Romanian Coat of Arms and year 1996 between laurel branches. At the lower-left coat of arms lies V.G. standing for Vasile Gabor, the engraver's name. 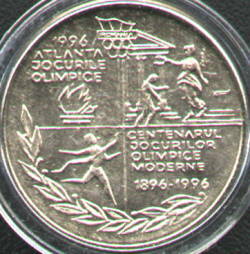 4th quartier: inscription "CENTENARUL JOCURILOR OLIMPICE MODERNE 1896-1996" meaning "CENTENNIAL OF THE MODERN OLYMPIC GAMES"
Reverses: As you see the reverses speak for themselves. 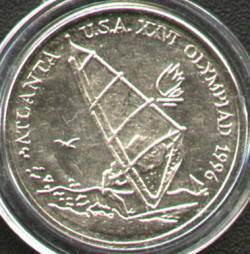 It's quite hard to explain why Romanian coins (such as these) have to have legends written completely in English, and even those badly written. 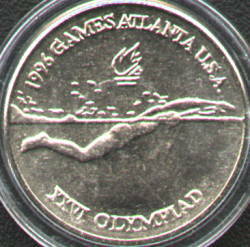 The set was issued on 31st of July 1996. 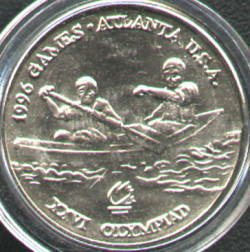 The maximum mintage of each coin was 19.600 pieces. 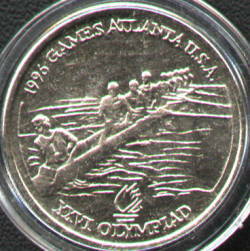 The Atlanta set comprises six steel and six silver coins. 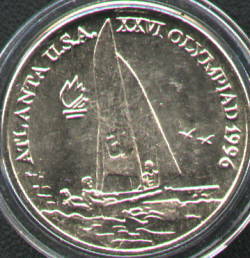 The obverses are common to the twelve and you have six different reverses of all. This rather ugly set was sold in 1996 for 310.000 lei (almost 90 US$).